That's a terrifying sight to have in your mirrors! 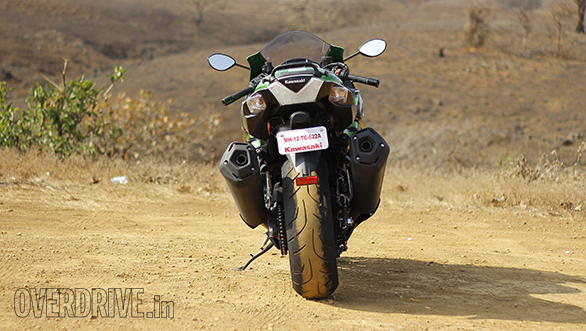 A large part of the Kawasaki Ninja ZX-14R's fearsome reputation is down to the way it looks. It has a frightening girth, is immensely long and its twin headlamps crack a deranged smile that will terrify little children in their sleep. Spotting one of these in your mirror is genuinely eye opening and you'd do well to get out of the way; quickly! A closer look will reveal many aerodynamic details like the blades in the fairing and small vanes in the mirror stalks and front mudguards. The dual exhausts already occupied so much real estate that Kawasaki could easily update them to meet the tight Euro IV norms without changing the design. Like its nemesis, the Suzuki Hayabusa, the Kawasaki ZX-14R discards classic design charm for a face that sears itself into the temporal lobe, whether you like it or not. For 2016, Kawasaki has retained the insanity but added a splash of black to the fairing and made the belly pan green in turn. The dashboard continues with the twin analogue clocks flanking a digital screen. The screen now switches from black lettering on a white background to vice versa based on viewing requirements. Other visual differences are the new smoke effect oil reservoirs for the front brake and clutch. The two big changes though lie in the front brakes and rear suspension, both top drawer components that we'll get to later. Interestingly, the aforementioned brakes and suspension are not available on the standard Kawasaki Ninja ZX-14R overseas but on the SE or Special Edition model. The SE internationally only ships in full black but Kawasaki India appear to be giving us a regular black-green scheme on a SE-spec motorcycle. While the company doesn't categorically call it the SE, they have confirmed that this is the only spec available in India. Sure it looks intimidating, but the real anxiety sets in on the very first ride. Wheeling the 270kg 14R out of a crowded parking lot sets off panicked thoughts of how on earth you're supposed to ride this thing in traffic. But incredibly, all the fear melts away the moment you set off. Within minutes, the Kawasaki ZX-14R feels almost natural in traffic, responding well to counter steer inputs and feeling reasonably agile in traffic. Soon, you're part of the ebb and flow around you and the only thing to watch out for is the wide exhausts when crawling through small gaps. With this update, Kawasaki raised the clip-ons slightly and brought them closer to the rider, making the riding position more comfortable. 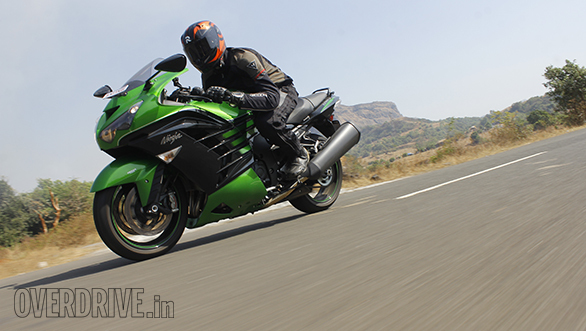 In the city, the Kawasaki ZX-14 has an absorptive ride, doesn't get unbearably hot and is supremely refined. The engine makes the same 200PS (210 when the ram air effect kicks in) and 158Nm as before but uses revised ECU mapping to comply with Euro IV. 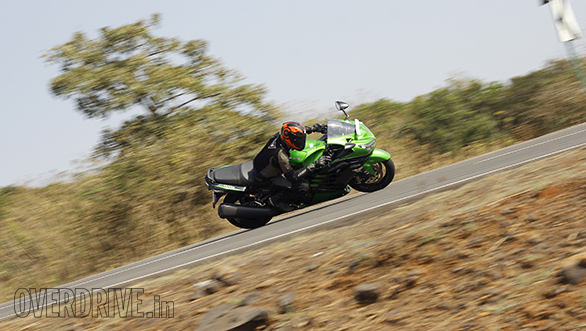 With a restrained right wrist, the only indication of the colossal power is the tractability the engine offers. Sixth gear pulls cleanly from 40kmph while third gear at the same speed produces eye opening acceleration. 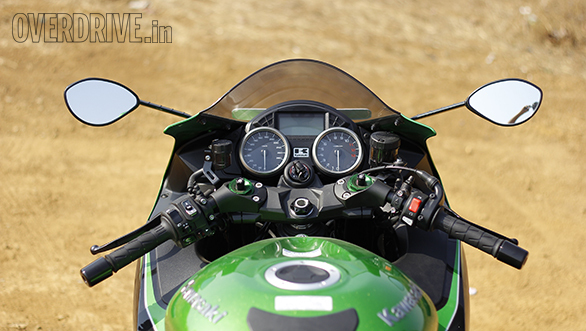 You can select either Full power or choose the Low power mode that reduces power by 25 per cent and offers milder throttle response. A 3-stage traction control system keeps all that power under control, highly appreciated on Mumbai and Pune's slippery roads. Naturally, it's no Pulsar through the gaps and parking will be a nightmare, but you can actually ride it through traffic without hating being in the situation. Easy to be fooled into thinking the ZX-14R runs a couple of jet engines. It almost feels that way for the rider too! That the ZX-14R can be mild mannered is completely forgotten the first time you open the throttle with any sense of purpose. So violent is the rate of acceleration that I only once cracked it wide open in first gear to see what it felt like. It had me screaming in my helmet like a madman. For the first moments of the 3.0s run from 0-100kmph you feel the long 1,441mm wheelbase keeping things stable but almost immediately the front wheel wants to paw at the sky, only to be kept grounded by the traction control system. Of course, many large capacity sportbikes will offer similar sensations but what makes the ZX-14R so amazing is how it keeps building speed. 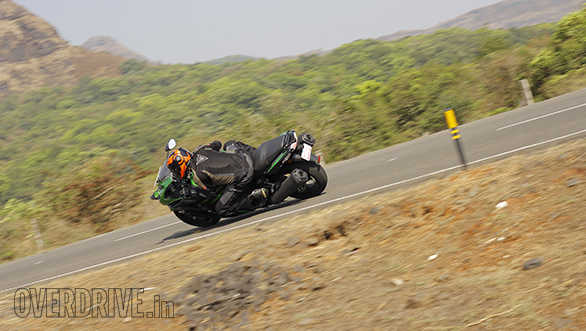 Even in 6th, the jump from 180kmph to 220kmph is over in a blink and the pace keeps building relentlessly. The limited top speed of 300kmph feels completely believable but I'll save that for another day in a safer environment and a cleaner pair of underwear. It soon becomes evident that what's equally amazing and deadly about this motorcycle isn't just how it gathers pace, but the way it hides the speed from you. For perspective, the Suzuki GSX-S1000 feels far more rabid thanks to its shorter gearing and the raw Gixxer K5-based engine. But with the naked S1000 you tend to back off after blasting to 160kmph thanks to the complete lack of wind protection and the higher revs the engine is holding. 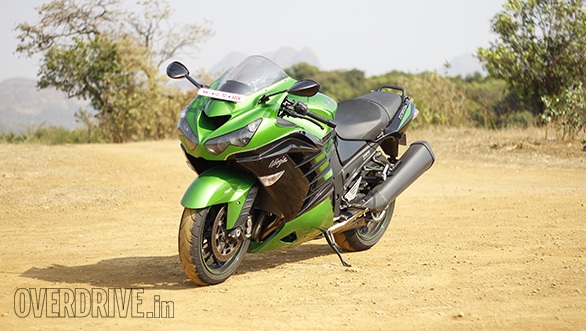 The ZX-14R meanwhile, keeps you isolated from the wind and the engine always has much more to give - 160kmph is just over 5,000rpm in sixth gear! In a perfect world this would be the perfect highway bike. Yes! 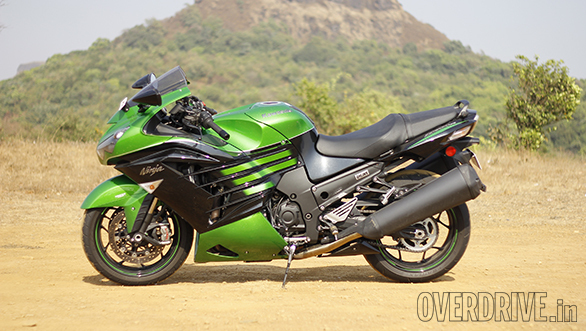 The ZX-14R always had a capable chassis, one that feels confident and stable rather than sharp and reactive. 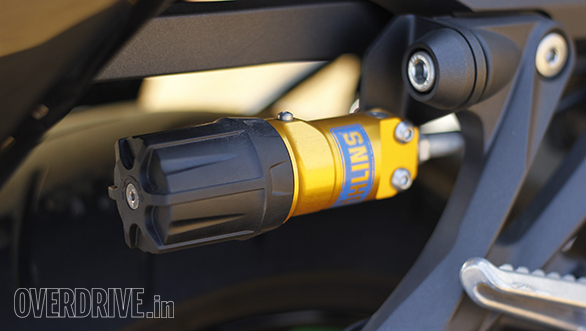 The SE version benefits from an Ohlins rear shock with a remote preload adjuster and Brembo's acclaimed M50 monoblock calipers biting on twin 310mm discs up front. The brakes didn't have quite the initial bite I was expecting but offered strong and consistent power to slow this heavy missile down for the corners. Initial turn-in takes a bit of leverage, but once in the Kwacker feels firmly planted with plenty of grip. The creamy smooth fueling helps to get back on the gas without upsetting the chassis. You could literally lean it to knee scraping angles in the right corners. 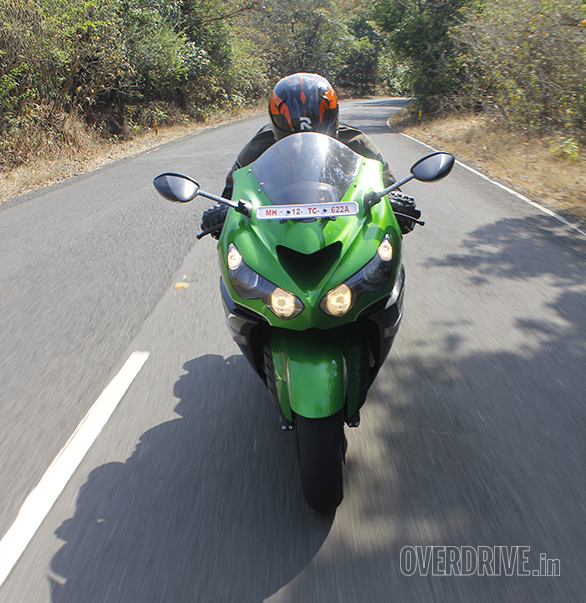 Naturally, the ZX-14R prefers long sweeping corners and can be a bit of work on a tight, switchback riddled road. This update has taken an already incredible motorcycle and elevated it even further. I'll admit I thought it would be an excessive, unusable toy in India, but I'm now sufficiently convinced that the 14R can work here. Provided you have supreme levels of self control and give the motorcycle all the respect it demands. Its asking price of Rs 20.9 lakh on-road Mumbai is high but you get a lot of motorcycle in exchange. Still, there's no escaping the fact that you can never safely use this motorcycle anywhere close to its full potential in our environment. I find that frustrating and it's why I will always admire the ZX-14R but don't really aspire to own one.